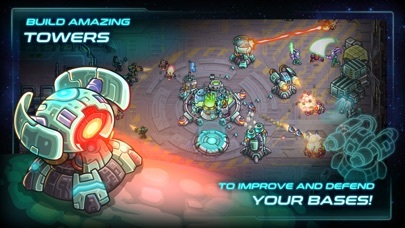 From the creators of the award winner Kingdom Rush trilogy comes the most extraordinary space odyssey. 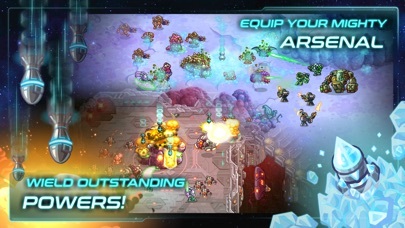 A real-time, dynamic and deep strategy game that will transport you to amazing and unknown planets. Immersive, engaging gameplay, ridiculously appealing art, and a touch of silly humor. 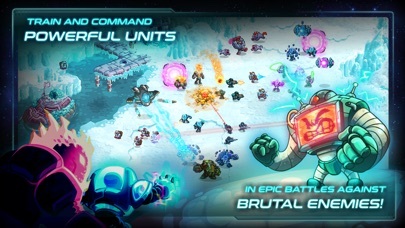 Brave soldiers, mighty mechas and powerful aliens await your command to face the greatest challenges. 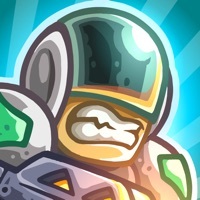 Recruit and train the greatest heroes in the galaxy, lead them into dangerous missions against near impossible odds and unleash their mighty powers and abilities. 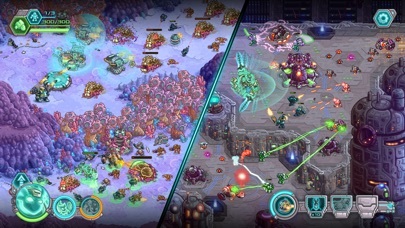 Adapt your strategy by changing the role of your troops even in the thick of the combat, from ranger to sniper, from flamethrowers to missile launchers. 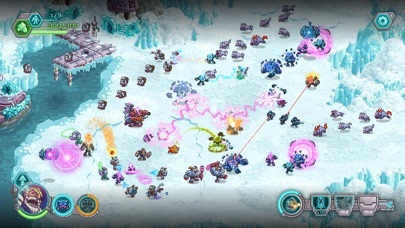 Turn the tide of battle with bomb strikes, intelligent mines, support troops, turrets and a wide range of special weapons. Armies of robots, crushed starships, gigantic monsters, unknown races, brave assaults, desperate rescues, audacious sabotages... the galaxy needs your command. 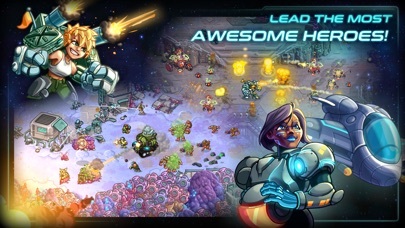 The galaxy needs the Iron Marines Game Features Lead your troops in 21 campaign missions across three different worlds. Get ready to launch bold attacks, hold your ground, rescue civilians, hack supercomputers and all kind of heroic stuff. Each mission requires new tactics and actions to achieve victory. Test your wit on 17 Special Operations with their own combat rules and no mercy at all. Each stage a challenge to remember, with scars to prove it. We dare you. Unlock the Impossible Mode. Only for the most reckless of the dauntless. We double dare you. Defeat massive and unique Bosses in epic battles. They are mean, they are really really huge and they are determined to crush you. Suit up, Marines!! 40+ Upgrades to improve your strategy and empower your units with defense drones, napalm rockets, ricocheting blasts and much more. 14 Heroes with outstanding powers at your command. Train them to their full awesomeness or annoy them at your own risk. 8 Special Weapons to unleash hell on your enemies and give your tactics even more depth. What’s better than a well placed missile? An orbital strike of 50 high explosive missiles! Complete any of our 70+ Achievements and claim your well deserved reward Find your fair challenge choosing your difficulty mode: Casual, Normal or Veteran. Don’t get cocky! Or Do! Your choice! This game is so fun. And challenging. Disappointingly clunky, imprecise controls and gameplay especially coming from my favorite mobile game developer. It’s a fine game. Decent strategy. Not that fun though. Most app games I find very boring. Iron marines is definitely worth playing. Heavy In App Purchases + upfront cost?! They start you with barely any heroes and try to force you to buy more after purchasing the game for $5. Each hero is about the cost of the whole game, some a bit more. The IAP packages go up to $70+, so they're really praying on those with gaming problems that are willing to give that amount of money for an outdated genre... Absolutely pathetic. Choose one, free with iap, or pay upfront with everything in game. First time I’ve ever wanted a refund, and now I have to waste some time figuring out how to actually do that. I don't care about the $5, I just don't want to support their shareholders. To the team: Your company clearly doesn't care about only one person's irritation (especially seeing your generic copied and pasted responses to other users that have complained) but this will be the last time I purchase from your company. Game is great all around. It’s really difficult for beginners which I have experience playing RTS games with Starcraft but this makes it seem hopeless sometimes. I feel it is a little unbalanced maybe or there should be some type of checkpoint system because starting over after your feel you tried your hardest is very discouraging. Add a way to skip intro’s. They get annoying when you are trying to beat a level and you cannot skip.